The changing season and the cultural shift that happens surrounding “back to school” has inspired Yoga Farm to reconnect with opportunities to spread the LOVE and RADIANCE we create here, OFF the farm and out to our local school districts. We have already experienced the joy and rapture of working with Lansing School District and the William George Agency / George Junior Republic. 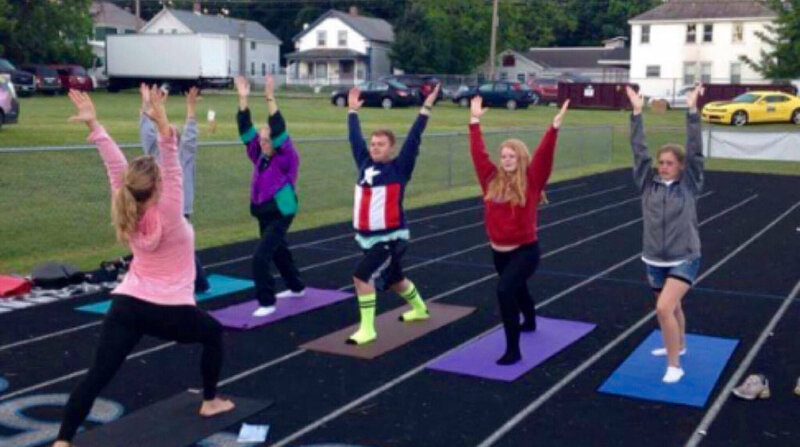 As we continue to build and grow with their needs we are also seeking more opportunities to bring yoga and mindfulness into other districts. Teaching yoga and mindfulness practices to teens is such heart-centered work. What I love the most about the weekly sessions at William George is the clear candor that is present for the students there. They are without a filter or a major assumption during yoga. They laugh, grunt, exclaim and, maybe even a times, roll their eyes. It is a beautiful display of authentic adolescent humanity and I cannot get enough. Guiding them through simple breath practices and hearing them reflect that they feel relaxed and calm is heartwarming. Never too serious, never forced or fake, the lessons I receive from working with teens are immeasurable. Teaching yoga and mindfulness in schools allows me to see how quickly teenagers can pick up new concepts and ideas and put them to practice. WHERE ELSE ARE WE WILLING TO GO? If you read this blog post and know of a district that could benefit, or you have a contact you would like to share with us, it would bring even more joy into the work we do everyday here at Yoga Farm. Or perhaps the idea of Yoga Farm Teachers coming to lead meditation, Qigong or yoga-in-business attire to your own workplace sounds delightful! We would love to talk to your wellness committee or HR Director about our offerings. We offer corporate rates for memberships here, and we will bring classes and in-service workshops to you. Please take a look at our website that lists our offerings, then contact us to schedule a free in-house demo and conversation, or to let us know of someone we can chat with to explore possibilities.